This report presents the results of a survey of selected states regarding policies and practices dealing with arrearages. It highlights Colorado’s policies in relation to those adopted by other states. We focus on state practices dealing with retroactive support, default orders, the imputation of income, the accumulation of child support arrears during incarceration, as well as job programs and debt compromise arrangements. In our search for strategies to prevent and manage the accumulation of arrears among low-income noncustodial parents, we also examine studies of unpaid accounts conducted by large organizations similar to child support agencies in that they cannot choose their clients, such as public utilities and the IRS. 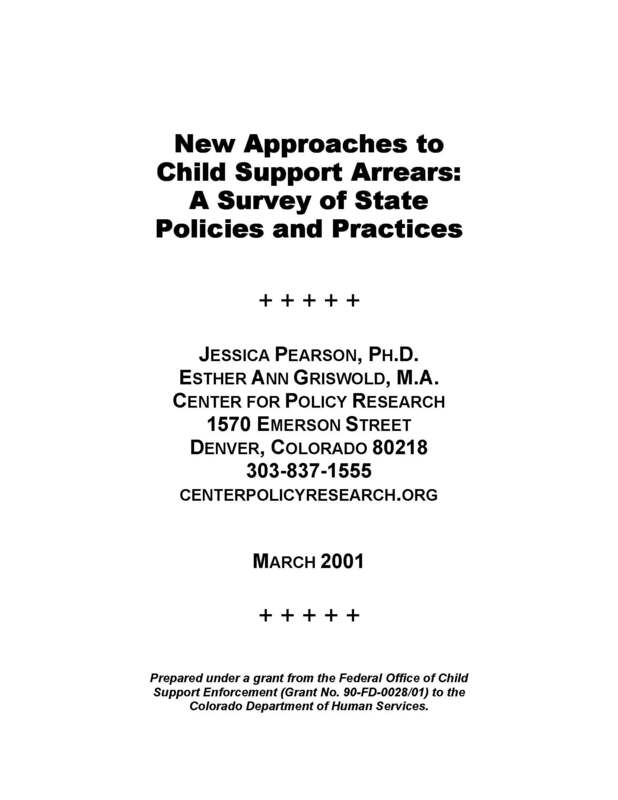 Finally, we examine the literature on child support arrears, including recent surveys conducted by the Office of the Inspector General (OIG) and other accounts of innovative legal and policy approaches that states have adopted to set child support awards and compromise arrearages owed to the state.